Our jewelries automatically comes with the design default locks but you may request certain lock types depending on your targeted market. 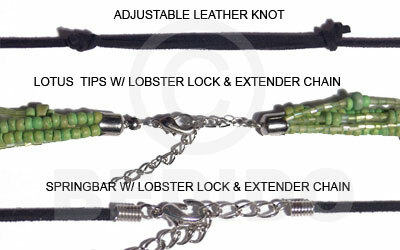 Many of our jewelries are for surfers or unisex clientele but sometimes they automatically come w/ lobster locks. 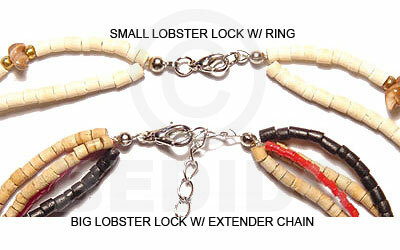 Lobster locks with extender chains are best for girls and women while barrel locks, locks with no metal findings such as adjustable leather knots, coco stoppers and coco hooks are best for boys, men, surfers or unisex. 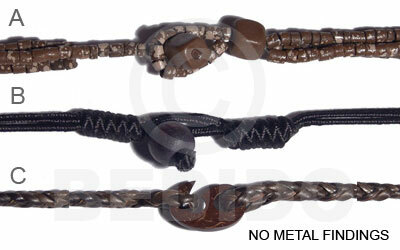 The images on the left shows our lock options for your reference. 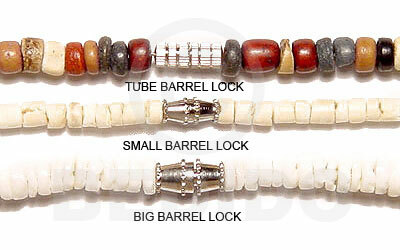 You may suggest your choice of locks for your selected jewelries to fit your targeted clientele. Just specify it upon ordering.